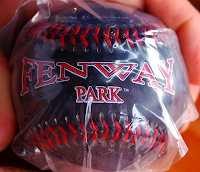 One of the two baseballs I got at Fenway Park is a blue baseball. This one says Fenway Park on one side and Built in 1912 on the other side. The other strip of the ball has a view of the field. It is different than many of the other balls of field views, as it shows the infield and not just an outfield view that could be any park since the Green Monster is also obviously there.